KING CLUB: The King Club in Madison will be closing its doors and reopening as Woofs. Clyde Stubblefield will [not] continue on Monday nights there once the remodeling is complete. Thanks to owners Tristan and Lisa for a lot of good memories. MAD-MIDWEST FEST: Madison’s The Inferno, ClubInferno.com, plays host to Mad-Midwest Fest, a show that features bands heading to Austin’s South By Southwest festival. Bands representing Madison, Chicago and Minneapolis will perform at The Inferno (1718 Commercial in Madcity) on February 22nd. Bands include Screamin Cyn Cyn and the Pons, The Dials, Ouija Radio, Bang! Bang! , Whore du Jour, and Vampire Hands. Altered Five features the Schroedl brothers Jeff and Scott. 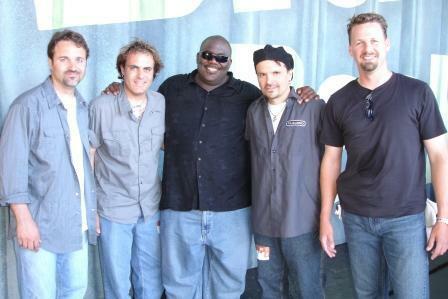 Scott has been giving drum lessons for eons it seems (I even took lessons from him about 7 years ago) and Jeff has worked in the industry with giants Hal Leonard for years. It looks like it’s all for the best, good luck guys! For more info go to AlteredFive.com or MySpace.com/alteredfiveband. 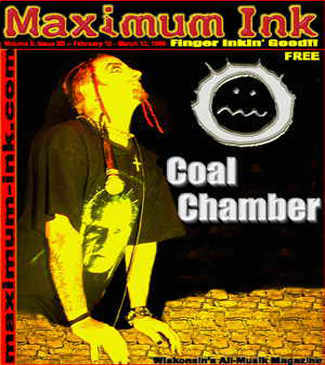 TEN YEARS AGO IN MAX INK: Coal Chamber fronted the cover of Max Ink’s February 1998 issue. I remember going to the Barrymore to see the tour when it came through Madison featuring both Coal Chamber and Sevendust. During that tour, Coal Chamber’s bassist Rayna Foss and Sevendust drummer Morgan Rose became metal’s heaviest couple and married a short time after. The couple is now divorced and have one child together, Kayla, born in October 1999. The Coal Chamber interview with Dez Fafara, who is currently the singer of Devil Driver, is online in our archives at at Coal Chamber in the Archives of Maximum Ink. ADVENTURES WITH NIKOLAI: It’s inevitable. If you get video games for kids on disc, it’s going to get scratched sooner or later, probably by circumstances unknown. Each and every discovery of said instance invokes a huge sense of loss. One day, I took Nikko over to Video Game X-Change on Madison’s east side after school. Nikko had never been to that store and was very happy to hear we might be able to fix his Xbox game The Outfit, as two levels of the game are un-playable. Lance the owner fired up his machine and popped in our disc. While waiting, we looked through his vintage archive of games that have long since been forgotten, an Ebay gold mine I bet!! It wasn’t long till Nikko spotted Darth Maul peering out of his packaging that touted “Double Lightsaber Included.” Gotta get back there for that one! Upon getting home we fired up the game and played the level we haven’t been able to play. Then, Nikko looked up from the game and said, “Dad, when are we going back to see your buddy so we can fix the other games?” A father’s work is never done! Lol, see you next month!